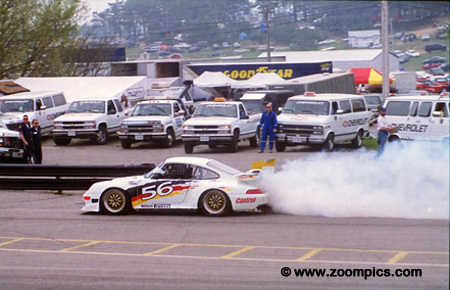 1996 marked the seventh season for the Sports Car Club of America’s (SCCA) World Challenge series. This season there were changes made to the classes. In 1995, there was the Sport, Touring and Super Production classes. Two categories were introduced in 1996 – Sports and Touring which were divided into four classes – Sport 1 & 2 and Touring 1 & 2. The 1996 Sport 2 class was based on the European FIA GT2 rules. The series also allowed competitors to use racing tires. As a result, companies such as Dunlop, Pirelli and Goodyear participated in World Challenge. 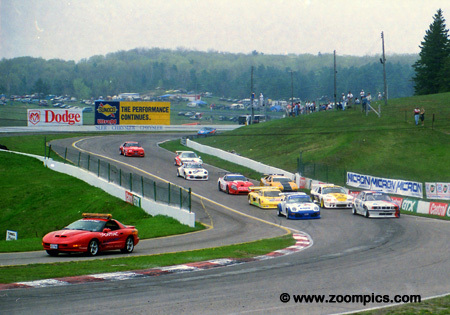 The Mosport round was the second of nine race weekends. This was one of the better attended events drawing eleven entries. Although the fields were small it was SCCA’s practice of inverting the five fastest qualifiers for the start which produced some great racing. The Sports 2 class enters corner-10 on the pace lap. On the front were Jochen Rohr in a Porsche 911 and Steve Dinan in a BMW 540i. The fastest qualifier Almo Coppelli started fifth in the Callaway Supernatural Corvette. Reeves Callaway’s company is known for modifying Corvettes. 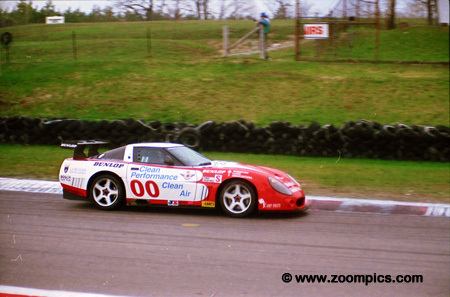 Once of these was the Callaway Supernatural Corvette driven by Almo Coppelli during the 1996 World Challenge season. The car was powered by 6.3-litre engine which produced approximately 475-horsepower. Coppelli was the fastest qualifier but started fifth he moved to the lead winning by a margin of 12.51-seconds. Mosler Automotive was a speciality car company producing low volume high-performance vehicles. The No. 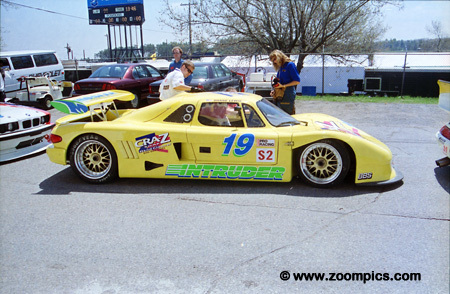 19 was a Mosler Intruder driven by Shane Lewis. Powered by a Corvette engine, there were only four cars produced. At Mosport Lewis qualified third and led briefly but he would finish second. Later in the season he would win three races and finish second in the championship just 2-points behind Coppelli. Doc Bundy drove the No. 50 Lotus Esprit Turbo. 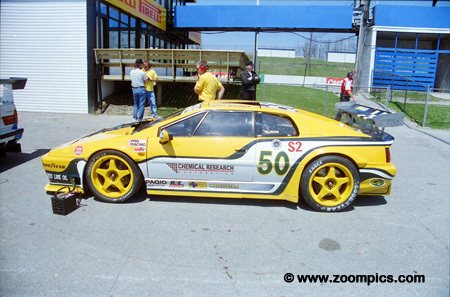 Bundy won the 1992 IMSA Supercar Championship title with a Lotus Esprit X180R. At the Mosport event, he started sixth and finished fourth – a lap behind the leaders Coppelli and Lewis. Bundy had a season-high second place at Minneapolis but problems at Lime Rock, Trois Rivieres and Sonoma. He finished fifth in the final standings. The second fastest qualifier was Rob Rizzo in the Saleen-Allen/Saleen Mustang. At the drop of the green flag, he made a very aggressive start and took the lead. Rizzo led the first 5-laps but rising engine temperatures and an oil leak forced him to retire. Team principal Steve Saleen debuted a car built to GT2 rules. It was completed just before the race and Saleen parked it after 8-laps. Jochen Rohr started on the pole but was passed in short order by Rob Rizzo. The Porsche 911 GT2 driver found himself in a heated battle with the Lotus Esprit of Doc Bundy. Rohr had tire issues while Bundy suffered from a lack of top-end speed - on a high-speed track such as Mosport this worked to Rohr’s advantage. Rohr was able to capture the final position of the podium. 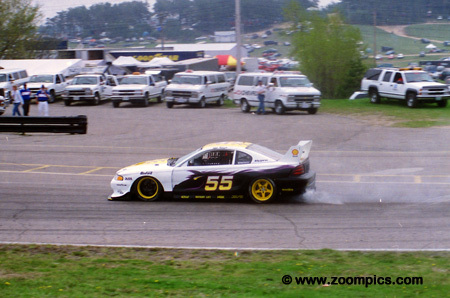 BMW aftermarket tuner Steve Dinan qualified his BMW 540 Sport fourth and started second. Dinan ran fourth for the first part of the race but on lap-19 he pitted for repairs. Falling out of contention he was classified seventh – 4-laps behind race winner Almo Coppelli. In the championship standings, Dinan finished sixth his best finish during the season was a fourth. The first retirement was Martin Snow in a Porsche 911 GT2. After starting seventh a turbocharger failure on the pace lap meant he did not complete a single race lap. He was classified in the eleventh position. Snow also competed in the S1 class driving a Porsche 911 GT1. This category competed at the final three rounds of the season. Snow won the title by 4-points - Klaus Bytzek finished second.